On July 30th, 1947, a true legend was born in the small village town of Thal, Austria. Arnold Schwarzenegger, the King of Bodybuilding, entered this world, destined to make an impact like no other before him. Today, 70 years later, Arnold has inspired millions of people with his incredible determination and confidence to make himself a success. Coming from truly humble beginnings, Arnold reached the top of his profession in three different careers – Bodybuilding, Acting and Politics. He is one of the biggest success stories in history and, as his business partner Jim Lorimer has often said, will still be talked about a hundred years from now because of the tremendous impact he has made on the world. Arnold is the Muhammed Ali of Bodybuilding, the King of the sport that brought bodybuilding out from the seedy underground where it was residing to the mainstream media. Thanks to his charm, charisma and confidence, Arnold was able to change the perception of bodybuilding to the average person. Soon after Arnold made his presence known, everyone started lifting weights to build a better body. Athletes, movie stars, models, kids, the elderly and even the average housewife or businessman began “pumping iron” because Arnold made it hip and cool to have muscles. The impact of Arnold on Bodybuilding cannot be overstated. Even today, almost 40 years since Arnold last stepped onstage, Arnold is connected to bodybuilding like Ali was to boxing or Jordan was to basketball. Anyone with muscles is referred to as “Arnold Schwarzenegger”. Even though professional bodybuilders over the last thirty years have gotten much bigger and more developed, it is Arnold who is still the person who is thought of as the best bodybuilder in the world. Arnold knew he was destined for bigger things from a very young age. As a young man growing up in a small farming community in Austria, he dreamed of moving to America. Watching movie reels of America in school, he was overwhelmed by the massive skyscrapers, the huge highways and the big cars. Arnold didn’t want the boring life of working in a factory or being a policeman like his father, earning a steady salary working towards a pension and marrying a local Austrian girl to raise a family. He wanted much more. Arnold found his way out when he discovered the sport of bodybuilding. He was lifting weights as a member of the local soccer team and he loved the challenge of training with heavy weights and pushing his body past normal limits. When he saw a movie poster for a Hercules movie starring Mr. Universe Reg Park, he immediately knew this was his destiny. He started buying bodybuilding magazines and read everything he could about Park. 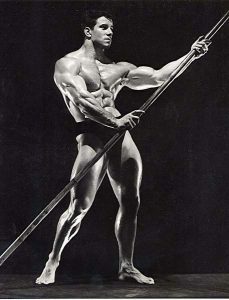 He discovered that Reg was born in England and had won the Mr. Universe title three times. He was one of the strongest and biggest bodybuilders on the planet and was now making movies, starring as Hercules in a series of forgettable films about the mythic hero. Arnold developed a Master Plan for himself to escape to America. He would begin weight training to develop his body, win the Mr. Universe title like his idol Reg Park, move to America because of his bodybuilding success and eventually star in the movies. He started hanging up pictures of Reg Park and other famous bodybuilders in his bedroom to keep his vision alive and motivate him to keep training hard. Arnold started training in a local gym in Austria, developing his physique under the guidance of his older mentors. He started entering competitions at 16 years old and was developing his soon to be famous physique very quickly. At 18 years old, Arnold entered the Austrian Army to fulfill his one year of required service. He kept up with his weight training while in the Army, often training after a full day of service doing his chores. During basic training, he became aware of a big contest that was going to be held in Munich, Germany. Unfortunately, he was confined to the base and was not allowed to leave. Risking everything, Arnold climbed over the wall and took a train to Munich to compete in the contest. The contest was the Junior Mr. Europe contest and it was held on October 30th, 1965. The massively developed physique of Arnold easily won the contest and gained the attention of all the judges and spectators. Even more important, Arnold met two men who were to play a key role in changing his life. Albert Busek, a local gym owner and magazine publisher in Germany, was blown away by Arnold’s massive physique. He knew he was watching a future superstar and he quickly introduced himself to Arnold. Albert soon helped to promote Arnold by publishing his picture in his magazine and securing him a job working as a gym manager in Germany after his service with the Army was completed. Arnold also met his life long friend Franco Columbu at the contest. Franco was originally from Italy but was living in Germany at the time. 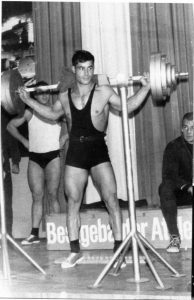 Franco entered and won the powerlifting competition that was held with the Junior Mr. Europe title. Arnold was impressed with Franco’s incredible strength despite his small and skinny physique while Franco was impressed with Arnold’s massive muscles and his confident persona. Arnold went back to the Army camp and was arrested immediately upon his return. He was confined to the prison barracks at first but soon his commanding officers used his story of success as motivation for the other soldiers. Arnold was also allowed to train four hours a day to continue building his physique to represent Austria. After his release from the Army, Arnold moved to Munich, Germany and began working as a gym manager for a local gym. He began training with Franco and his physique got even bigger and more developed. At 19 years old, Arnold sported 20 inch arms and was gaining recognition as one of the biggest bodybuilders in the world. He entered and won the 1966 Mr. Europe contest and decided to enter the famous NABBA Mr. Universe contest, held every year in London, England. He entered the contest as a complete unknown but soon gained the favor of the crowd with his huge physique and magnetic personality. 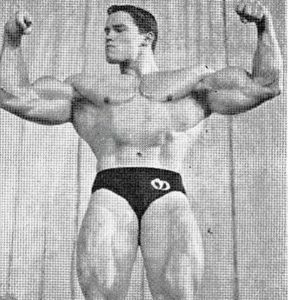 At only 19 years old, Arnold placed second in the tall class to the American bodybuilder Chet Yorton. He was also brought out for an encore after his posing routine due to the rapturous applause from the audience. One of the judges in the contest, Wag Bennett of England, befriended Arnold after the contest. Wag told Arnold he had him in first place and he was sure he could win it all the next year. 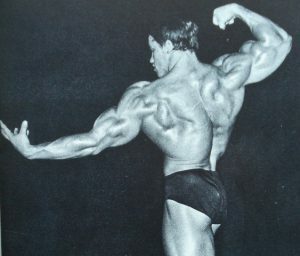 Wag invited Arnold to stay with him and his family at his house and he would help schedule some posing exhibitions for Arnold throughout Europe. Wag also helped Arnold with his posing, showing him how to do the transitions between poses and how to make his posing look more powerful and dramatic by using music. 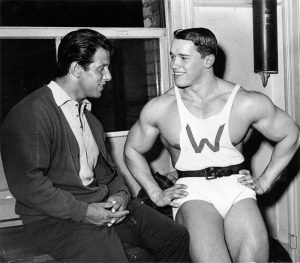 Arnold even got to meet his idol Reg Park at one of the contests. Reg was very impressed by this big, young bodybuilder and he promised Arnold that if he won the Mr. Universe the next year, he could accompany Reg on a posing exhibition tour in South Africa. In 1967, after another year of intense training, Arnold was even more impressive. He entered the NABBA Mr. Universe in London and had a tough battle with American Dennis Tinerino, who had just won the Mr. America that year. However, Arnold’s impressive mass and charisma allowed him to defeat Tinerino. In the end, Arnold Schwarzenegger was the new Mr. Universe. At only 20 years of age, Arnold was the youngest Mr. Universe in history, a record that still stands today. 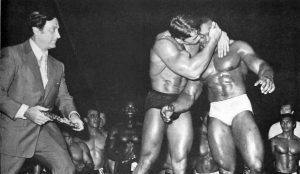 As promised, Reg Park took Arnold with him on a series of posing exhibitions throughout South Africa. Arnold stayed at Reg’s house and met his beautiful wife and children. Arnold’s vision became clear. He would win more bodybuilding titles, go into business, make lots of money so he could live in a magnificent house like Reg, marry a great woman and have a family, just like Reg Park. Returning to Munich, Arnold was more motivated than ever. He started training even harder, developing a double split training routine so he could train twice a day while still running his gym and catering to his clients. Arnold got even bigger, weighing more than 250 pounds. He would often go out to the woods with a group of friends and train for 3-4 hours on just one exercise in order to shock the muscles into growth. 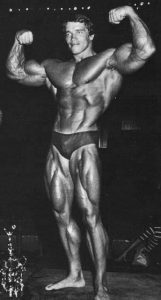 In 1968, Arnold won his second NABBA Mr. Universe title in the Professional division. He then accepted an invitation from magazine publisher Joe Weider to compete in America in the IFBB Mr. Universe in Miami, Florida. Unfortunately, Arnold was defeated at the contest by a very lean and tan Frank Zane, coming off his recent win at the IFBB Mr. America contest. Arnold was extremely upset after losing to a much smaller Zane. The day after the contest, Arnold had breakfast with Joe Weider, the magazine publisher for Muscle Builder magazine. Joe offered to bring Arnold to America and set him up with an apartment and a car in exchange for Arnold working for the magazine. Arnold immediately accepted, hoping to show these American bodybuilders that he was the best in the world. Arnold moved to Southern California and began training at Vince’s Gym before finally moving to Gold’s Gym in Venice, California by the beach. He refined his diet in order to shed excess fat and create a more symmetrical and defined physique. He also talked Joe Weider into moving Franco Columbu from Germany to America so he could train with his best friend to defeat all the American bodybuilders. One year later, Arnold was better than ever. Having lost fifteen pounds of fat, his physique was now massive but sculpted and cut. He flew over to London, England to win his third NABBA Mr. Universe title in the Pro division. He came back to America to avenge his loss to Zane by easily winning the IFBB Mr. Universe in New York City. Arnold won all the body part awards as well as the overall title. Arnold also entered the 1969 Mr. Olympia contest that night but suffered a close defeat at the hands of Sergio Oliva. Sergio was an awesome specimen who possessed inhuman proportions along with incredible muscle mass. Even though Arnold had made great progress in the last year, it was still not enough to defeat the great Sergio. He came away from the contest humbled but more determined to win it all the next year. One more year of intense training with Franco had transformed Arnold’s young 23 year old physique into a bigger, better version. His goal was to defeat Sergio Oliva and become the best bodybuilder in the world. As he was training one day in Gold’s Gym, Arnold received a phone call from promoter Jim Lorimer. 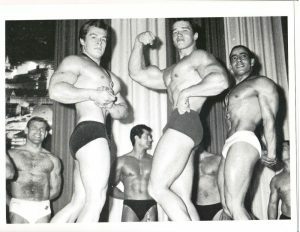 Jim invited Arnold to compete in the 1970 AAU Professional Mr. World contest in Columbus, Ohio. Arnold informed Lorimer that he would love to compete in his show but it would be impossible because he would be competing that weekend in London to win his fourth NABBA Mr. Universe title. Lorimer made arrangements to fly Arnold overnight from London to the United States in order to compete in the Mr. World contest the day after the Mr. Universe. 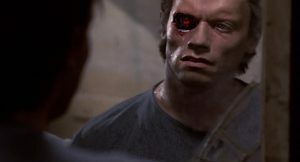 Arnold accepted the offer but was skeptical that Lorimer could pull off these challenging travel plans. At the 1970 NABBA Mr. Universe, Arnold easily won his fourth title, beating out his idol Reg Park in the process. 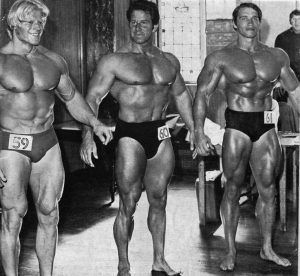 After the contest, Arnold along with Franco, Dave Draper and Boyer Coe, flew overnight to New York and then boarded a private jet to Columbus, Ohio for the AAU Mr. World contest. 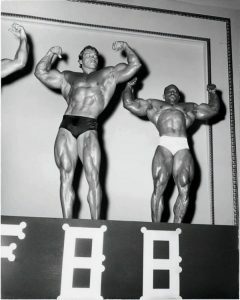 Arnold was surprised to see Sergio Oliva was also entered into the contest. Arnold wasn’t planning to face Sergio onstage for two more weeks when they would enter the Mr. Olympia contest. 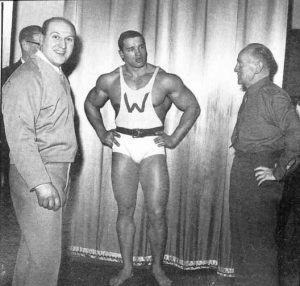 In a shocking decision, Arnold defeated Sergio at the AAU Mr. World contest in front of the television cameras from ABC-TV’s Wide World of Sports. 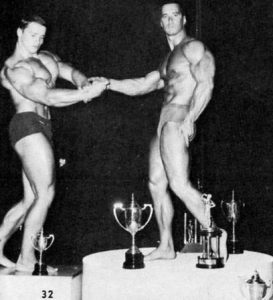 Arnold was so delighted with how the contest turned out that he made arrangements with Jim Lorimer to begin promoting the Mr. Olympia contest after he retired. 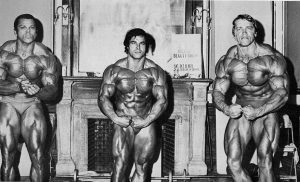 Two weeks later, the historic posedown between Arnold and Sergio took place at the Brooklyn Academy of Music in New York for the 1970 Mr. Olympia contest. Arnold looked better than ever, bigger and more defined with a confident and precise posing routine. 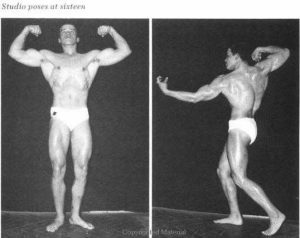 All year long, Arnold had studied films of Oliva posing onstage in order to see what weak points Sergio had and how he could exploit those chinks in his armor during their confrontation at the Mr. Olympia contest. His strategy worked and Arnold defeated Sergio at the 1970 Mr. Olympia contest to become the best bodybuilder in the world. In less than a month, Arnold had defeated all the top bodybuilders in the world in three different federations. It was the bodybuilding version of the Triple Crown – NABBA Mr. Universe, AAU Mr. World and IFBB Mr. Olympia. Arnold was now the King of Bodybuilding. Arnold went on to dominate bodybuilding by winning the Mr. Olympia contest six consecutive times. He retired in 1975 with five Mr. Universe titles and six Mr. Olympia victories along with wins at the Mr. World and Mr. International. Along the way, he defeated a host of iconic bodybuilding legends such as Sergio Oliva, Serge Nubret, Franco Columbu, Frank Zane and Lou Ferrigno. 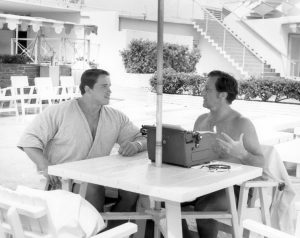 In 1976, Arnold kept his word and teamed up with Jim Lorimer to begin promoting the Mr. Olympia contest in Columbus, Ohio. Arnold and Jim redefined bodybuilding’s biggest event by adding professional stage design, contest promotion and mainstream television coverage. The first event they held in 1976 received rave reviews from fans and the bodybuilding industry alike. In addition to improving the look and exposure of the contest, they also dramatically increased the prize money to the competitors, opening the door for professional bodybuilding. Arnold began promoting the sport of bodybuilding in other ways as well. In 1977, Arnold released his first book, Arnold: Education of a Bodybuilder. 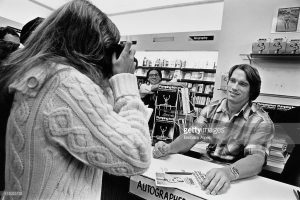 Arnold traveled to every state in the country doing interviews with radio, television and newspapers to promote the book. It was eventually on the New York Times best seller list. 1977 was also the year that the movie “Pumping Iron” was released. As the star of the soon to be famous documentary, Arnold was the designated spokesperson for the movie, again traveling the world to do interviews and promote the movie. Arnold showed the world that bodybuilders were not muscle bound, inarticulate lunkheads. Instead, Arnold proved to America at large that bodybuilders could be smart, funny and witty. Arnold also began his film career as soon as he retired from competing. His first film, “Stay Hungry”, was released in 1976. 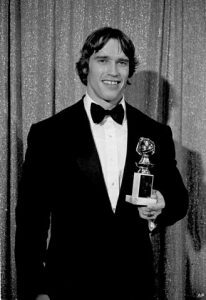 Arnold was a newcomer to Hollywood but he received great reviews from critics and won the Best Acting Debut award at the 1977 Golden Globes. The documentary “Pumping Iron” followed the next year, also earning surprisingly good reviews from movie critics around the country. After several smaller roles in movies like “The Villain” (1979), “Scavenger Hunt” (1979) and “The Jayne Mansfield Story” (1980), Arnold finally got his big break when he starred in “Conan the Barbarian” (1982). Arnold was now a major movie star, having fulfilled his dream of starring in films just like his idol Reg Park. More big Hollywood movies soon followed including “Conan the Destroyer” (1984), “The Terminator” (1984), “Commando” (1985), “Raw Deal” (1986), “Predator” (1987), “The Running Man” (1987), “Red Heat” (1988) and “Twins” (1988). Arnold was one of the biggest box office movie stars in the 1980’s, helping to usher in the muscular action hero along with Sylvester Stallone, Jean Claude Van Damme and Chuck Norris. 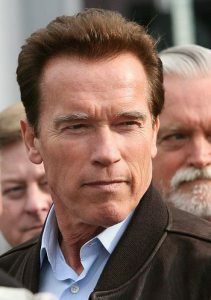 By the time the 1990’s arrived, Arnold Schwarzenegger was the number one movie star in the world with the release of “Total Recall” (1990) and “Terminator 2: Judgement Day” (1991). Arnold Schwarzenegger is a true legend. By believing in himself, setting outlandish goals and taking chances, Arnold went beyond what anyone would have thought possible. He achieved his dream of moving to America, conquering the sport of bodybuilding, moving onto a whole new career in cut throat Hollywood and becoming the number one movie star in the world. Along the way, he became famous all over the world, acquired millions of dollars, invested in real estate and other ventures and is so famous, his voice alone makes him recognizable to nearly everyone on the planet. Arnold also became a husband to Maria Shriver in 1986 and is now the proud father of five children. 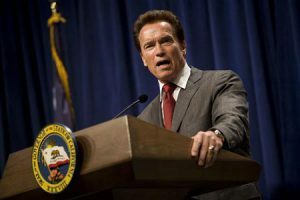 Just when no one thought he could achieve more, Arnold decided to run for the office of Governor of California in 2003. He won the election and served for six years as Governor in California. Although his fame and riches have taken him way beyond the sport, Arnold still promotes bodybuilding by holding his annual Arnold Classic (now called the Arnold Sports Festival) at every continent in the world. Arnold continues to inspire athletes and youngsters all over the world by providing an amazing event for so many to compete in. Those of us in the bodybuilding world will always remember Arnold as the King of Bodybuilding. His magnificent Mr. Olympia physique is, to many, still the epitome of what a top bodybuilding physique should look like. We will always remember Arnold as the confident, smiling competitor who was able to psych out his opponents and charm the judges and audience with his amazing charisma and even more spectacular physique. Happy Birthday Arnold and thank you for everything you have given us! Welcome to the Bodybuilding Legends Show!